I wanted to start off by saying welcome to all you new PGEW readers that happened to stop by as a result of yesterday’s Hearty Mushroom & Potato Soup recipe. I had no idea a flu-inspired recipe would be such a hit! It also tickles me to know that I had more male readers than I originally thought (I have become a total site stats junkie lately and am obsessed with demographics right now). I certainly didn’t mean to poke too much fun at you guys yesterday (okay, maybe I did just a little), but it sure got you to come out of the woodwork and make your presence known! Good to know you’re out there. I’m not sure why this happens, but whenever I’m sick I get these major feng shui attacks and start cleaning everything out: cupboards, drawers, you name it. My most recent victim was my freezer. There wasn’t too much to do in there since it’s not that full, but the bread was definitely a problem. See, I freeze my bread so that it keeps longer, something quite useful for me since I don’t eat it all that often. Unfortunately, this also means that it can pile up after awhile, and that’s just the problem I was facing. Things were made even worse in there because of the recent delivery of two great loaves of bread from Nature’s Pride (that Whole Wheat bread is SO good! ), the latest offer from the Tastemaker Program. I really needed to clear some of that space but didn’t want to throw away the bread either. What to do, what to do? 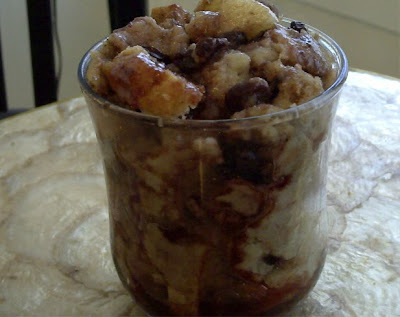 After mulling it over for awhile I decided the best way to fix this problem was to make some bread pudding. I’ve always been a big fan of any recipe that can make good use of forlorn, forgotten food and leftovers. After participating in the Hunger Challenge last month, I have become even more conscious of making use of every last bit of every ingredient I buy so that none goes to waste. Making bread pudding is one great way to do this since you can also make use of those last bits of milk in the carton and those last couple of eggs, even random pieces of fruit. It’s one of those “kitchen sink” recipes – everything but the proverbial sink goes in! I decided to add a lone Bosc pear to this batch for extra flavor and texture, dusting them generously with some spices to really enhance the flavor. To keep things on the lighter side (and because frankly, that’s all I had), I only used two eggs and a mixture of milk and apple juice for the custard. I know bread pudding is supposed to be a nice, rich affair, but some recipes are far too heavy for my liking. The use of apple juice with the milk not only helps to cut back a bit on the fat content of the dish while keeping a creamy texture, it also gives it extra flavor and sweetness without having to add too much extra sugar. Preheat the oven to 350°. In a small bowl combine the raisins and ¼ c red wine and set aside. Next, combine the cinnamon, nutmeg and teaspoon of sugar in a bowl and add the diced pear. Toss until well coated and set aside. Grease a 9” x 13” baking pan and add the chunks of bread. Whisk together the eggs, milk, apple juice and sugar together in a large bowl and pour the mixture over the bread. Drain the wine from the raisins and reserve. Add the raisins and the pears to the bread & custard mixture and mix gently until everything is evenly combined. Bake for 20-25 minutes and allow to cool for a few minutes. In the meantime, melt the butter and sugar in a small saucepan over medium heat. Add the reserved wine that you used to soak the raisins and the other ¼ cup of wine and whisk together well. Continue whisking while the glaze comes to a low boil. Reduce heat and simmer gently for about 3 minutes, or until you have a smooth, light glaze. Remove from heat. Serve the bread pudding drizzled with plenty of glaze and enjoy! 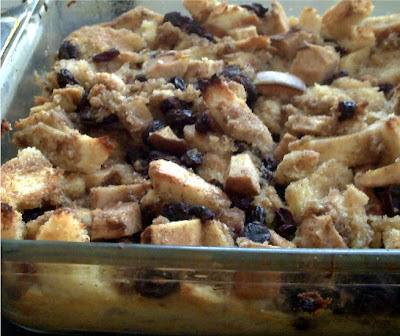 I'm not a fan of bread pudding (I know, I'm weird) but I can't wait to make the soup tonight! All the snow and crappy weather in the MidAtlantic is getting me in a soupy mood! That looks really moist and yummy! I also noticed that you are a singer and writer. My husband is too. He was a musician and wrote his own music. He is extremely talented. BUT I am a lil bias. Love your site. I subscribes so I will be back.